This article is about general space-related commerce. For entrepreneurial space ventures and colonization, see NewSpace. The first commercial use of outer space occurred in 1962, when the Telstar 1 satellite was launched to transmit television signals over the Atlantic Ocean. By 2004, global investment in all space sectors was estimated to be $50.8 billion. As of 2010, 31% of all space launches were commercial. The first commercial use of satellites may have been the Telstar 1 satellite, launched in 1962, which was the first privately sponsored space launch, funded by AT&T and Bell Telephone Laboratories. Telstar 1 was capable of relaying television signals across the Atlantic Ocean, and was the first satellite to transmit live television, telephone, fax, and other data signals. Two years later, the Hughes Aircraft Company developed the Syncom 3 satellite, a geosynchronous communications satellite, leased to the Department of Defense. Commercial possibilities of satellites were further realized when the Syncom 3, orbiting near the International Date Line, was used to telecast the 1964 Olympic Games from Tokyo to the United States. Between 1960 and 1966, NASA launched a series of early weather satellites known as Television Infrared Observation Satellites (TIROS). These satellites greatly advanced meteorology worldwide, as satellite imagery was used for better forecasting, for both public and commercial interests. On April 6, 1965, the Hughes Aircraft Company placed the Intelsat I communications satellite geosynchronous orbit over the Atlantic Ocean. Intelsat I was built for the Communications Satellite Corporation (COMSAT), and demonstrated that satellite-based communication was commercially feasible. Intelsat I allowed for near-instantaneous contact between Europe and North America by handling television, telephone and fax transmissions. Two years later, the Soviet Union launched the Orbita satellite, which provided television signals across Russia, and started the first national satellite television network. Similarly, the 1972 Anik A satellite, launched by Telesat Canada, allowed the Canadian Broadcasting Corporation to reach northern Canada for the first time. Beginning in 1997, Iridium Communications began launching a series of satellites known as the Iridium satellite constellation, which provided the first satellites for direct satellite telephone service. The commercial space transportation industry derives the bulk of its revenue from the launching of satellites into the Earth’s orbit. Commercial launch providers typically place private and government satellites into low Earth orbit (LEO) and geosynchronous Earth orbit (GEO). In 2002, commercial space transportation generated 6.6 billion dollars, which made up 6% of the total gross of commercial space activities. The Federal Aviation Administration (FAA) has licensed four commercial spaceports in the United States: the Virginia Space Flight Center/Wallops Flight Facility, Kodiak Launch Complex, Spaceport Florida/Kennedy Space Center/Cape Canaveral Air Force Station, and the California Spaceport/Vandenberg AFB. Launch sites within Russia and China have added to the global commercial launch capacity. The Delta IV and Atlas V family of launch vehicles are made available for commercial ventures for the United States, while Russia promotes eight families of vehicles. The three largest Russian systems are the Proton, Soyuz, and Zenit. Between 1996 and 2002, 245 launches were made for commercial ventures while government (non-classified) launches only total 167 for the same period. Commercial space flight has spurred investment into the development of an efficient reusable launch vehicle (RLV) which can place larger payloads into orbit. Several companies such as SpaceX and Blue Origin are currently developing new RLV designs. In the United States, Office of Commercial Space Transportation (generally referred to as FAA/AST or simply AST) is the branch of Federal Aviation Administration (FAA) that approves any commercial rocket launch operations—that is, any launches that are not classified as model, amateur, or "by and for the government." Commercial satellite manufacturing is defined by the United States government as satellites manufactured for civilian, government, or non-profit use. Not included are satellites constructed for military use, nor for activities associated with any human space flight program. Between the years of 1996 and 2002, satellite manufacturing within the United States experienced an annual growth of 11 percent. The rest of the world experienced higher growth levels of around 13 percent. Operating satellites communicate via receivers and transmitters on Earth. The manufacturing of satellite ground station communication terminals (including VSATs), mobile satellite telephones, and home television receivers are a part of the ground equipment manufacturing sector. This sector grew through the latter half of the 1990s as it manufactured equipment for the satellite services sector. Between the years of 1996 and 2002 this industry saw a 14 percent annual increase. Businesses that operate satellites often lease or sell access to their satellites to data relay and telecommunication firms. This service is often referred to as transponder leasing. Between 1996 and 2002, this industry experienced a 15 percent annual growth. The United States accounts for about 32 percent of the world’s transponder market. In 1994, DirecTV debuted direct broadcast satellite by introducing a signal receiving dish 18inches in diameter. In 1996, Astro started in Malaysia with the launch of the MEASAT satellite. In November 1999, the Satellite Home Viewer Improvement Act became law, and local stations were then made available in satellite channel packages, fueling the industry’s growth in the years that followed. By the end of 2000, DTH subscriptions totaled over 67 million. Satellite radio was pioneered by XM Satellite Radio and Sirius Satellite Radio. XM’s first satellite was launched on March 18, 2001 and its second on May 8, 2001. Its first broadcast occurred on September 25, 2001, nearly four months before Sirius. Sirius launched the initial phase of its service in four cities on February 14, 2002, expanding to the rest of the contiguous United States on July 1, 2002. The two companies spent over $3 billion combined to develop satellite radio technology, build and launch the satellites, and for various other business expenses. Several operators of Earth observation satellites, such as GeoEye and Spot Image, provide images commercially. 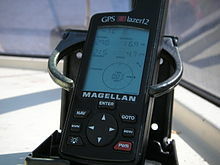 Magellan GPS receiver in a marine application. A satellite navigation system is a system of satellites that provide autonomous geo-spatial positioning with global coverage. It allows small electronic receivers to determine their location (longitude, latitude, and altitude/elevation) to high precision (within a few metres) using time signals transmitted along a line of sight by radio from satellites. The signals also allow the electronic receivers to calculate the current local time to high precision, which allows time synchronisation. A satellite navigation system with global coverage may be termed a global navigation satellite system (GNSS). Space tourism is space travel by individuals for the purpose of personal pleasure. The space tourism industry is being targeted by spaceports in numerous locations, including the Mojave Air and Space Port in California, the Clinton-Sherman Industrial Airpark near Burns Flat, Oklahoma Spaceport America in Sierra County, New Mexico, the Mid-Atlantic Regional Spaceport on the Delmarva Peninsula in Virginia, the Kodiak Launch Complex on Kodiak Island, Alaska, and the Esrange Space Center in Kiruna, Sweden. Commercial recovery of space resources is the exploitation of raw materials from asteroids, comets and other space objects, including near-Earth objects. Minerals and volatiles could be mined then used in space for in-situ utilization (e.g. construction materials and rocket propellant) or taken back to Earth. These include gold, iridium, silver, osmium, palladium, platinum, rhenium, rhodium, ruthenium and tungsten for transport back to Earth; iron, cobalt, manganese, molybdenum, nickel, aluminium, and titanium for construction; water and oxygen to sustain astronauts; as well as hydrogen, ammonia, and oxygen for use as rocket propellant. There are several commercial enterprises working in this field, including Planetary Resources and Deep Space Industries. Beyond the many technological factors that could make space commercialization more widespread, it has been suggested that the lack of private property, the difficulty or inability of individuals in establishing property rights in space, has been an impediment to the development of space for both human habitation and commercial development. Since the advent of space technology in the latter half of the twentieth century, the ownership of property in space has been murky, with strong arguments both for and against. In particular, the making of national territorial claims in outer space and on celestial bodies has been specifically proscribed by the Outer Space Treaty, which had been, as of 2012[update], ratified by all spacefaring nations. ^ Romano, Anthony F. (2005). "SPACE A Report on the Industry". Defense Technical Information Center. Retrieved 15 May 2011. ^ National Geographic (May 1962). "Telephone a Star" (PDF). Retrieved 15 May 2011. ^ NASA (26 April 2011). "Telstar 1". NASA. Retrieved 15 May 2011. ^ "Syncom 3". NASA. 26 April 2011. Retrieved 16 May 2011. ^ "TIROS". NASA. Retrieved 16 May 2011. ^ Hastings, David A.; William J. Emery (1992). "The Advanced Very High Resolution Radiometer (AVHRR): A Brief Reference Guide". National Oceanic and Atmospheric Administration. Retrieved 16 May 2011. ^ Whalen, David J. (30 November 2010). "Communications Satellites: Making the Global Village Possible". NASA. Retrieved 16 May 2011. ^ "Intelsat's Satellite Communication Highlights from the 60's". Intelsat. Archived from the original on 13 July 2011. Retrieved 16 May 2011. ^ Martin, Donald H. (2000). Communication satellites. AIAA. p. 220. ISBN 978-1-884989-09-4. ^ Putkov, Vladimir (April 2007). "Sputnik and Russia's Outer Space Activities" (PDF). United Nations Institute for Disarmament Research. Archived from the original (PDF) on 27 July 2011. Retrieved 16 May 2011. ^ "The World's First National Synchronous Communications Satellite". Boeing Company. 2011. Archived from the original on 8 January 2010. Retrieved 16 May 2011. ^ "ANIK The World's First Domestic Synchronous Communication Satellite". Institute of Electrical and Electronics Engineers. Retrieved 16 May 2011. ^ "Iridium – the satellite phone always rings twice". Wired. 7 March 1999. Archived from the original on 19 December 2010. Retrieved 13 June 2011. ^ "Commercial Space Transportation QUARTERLY LAUNCH REPORT" (PDF). Federal Aviation Administration. 1997. Retrieved 13 June 2011. ^ "FAA - Office of Commercial Space Transportation". FAA. ^ Kevin Bonsor, “How Satellite Radio Works,” HowStuffWorks. Accessed May 1, 2013. ^ a b Steve Parker, “XM plus Sirius = Satellite Radio Monopoly,” Huffington Post, July 24, 2008. ^ “Sirius Begins Satellite Service,” Archived 2017-06-07 at the Wayback Machine Radio, February 14, 2002. ^ “Satellite Radio Technology,” spacefoundation.org, 2002. Accessed May 1, 2013. ^ "Mojave Air and Space Port". Mojave Air and Space Port. Retrieved 15 May 2011. ^ Hennigan, W. J. (5 May 2011). "Virgin Galactic reaches key milestone in latest test flight". Los Angeles Times. Retrieved 15 May 2011. ^ "OKLAHOMA SPACE INDUSTRY DEVELOPMENT AUTHORITY". Oklahoma Space Industry Development Authority. Retrieved 15 May 2011. ^ Boyle, Alan (13 June 2006). "Regulators OK Oklahoma spaceport". MSNBC. Retrieved 15 May 2011. ^ "Spaceport America". Spaceport America. 2011. Retrieved 15 May 2011. ^ "First spaceport runway opens in US". Al Jazeera. 24 October 2010. Retrieved 15 May 2011. ^ Mid-Atlantic Regional Spaceport (2011). "Mid-Atlantic Regional Spaceport". Retrieved 15 May 2011. ^ Seitz, David E.; Keith Koehler (22 February 2010). "NASA Increases Support Contract to Mid-Atlantic Regional Spaceport". NASA. Retrieved 15 May 2011. ^ Alaska Aerospace Corporation (2009). "History and Organization". Alaska Aerospace Corporation. Archived from the original on 7 July 2011. Retrieved 15 May 2011. ^ David, Leonard (13 December 2005). "Virgin Galactic Sets Deal With New Mexico Spaceport". Space.com. Retrieved 15 May 2011. ^ Ganapati, Priya (18 March 2009). "Space Tourists Pack Bags for 2011 Vacation". Wired. Retrieved 15 May 2011. ^ Agence France-Presse (18 March 2009). "Space tourism to take flight in 2012". Google News. Retrieved 15 May 2011. ^ "Plans for asteroid mining emerge". BBC News. 24 April 2012. Retrieved 2012-04-24. ^ a b Simberg, Rand (Fall 2012). "Property Rights in Space". The New Atlantis (37): 20–31. Archived from the original on 2012-12-15. Retrieved 2012-12-14. This page was last edited on 15 October 2018, at 21:09 (UTC).